For 30+ years we have built a reputation for excellence in engineered films, foils and fabrics for aircraft and spacecraft applications. Our products are qualified on over 100 specifications covering commercial, defense, military, and space program applications. Whether you need us to design a new custom product or need help solving an unexpected challenge, at Dunmore Aerospace we stand ready to go...Above and Beyond. Dunmore Aerospace multilayer films, with engineered absorptance and emittance properties, are used to manufacture a MLI blanket for passive thermal control systems. 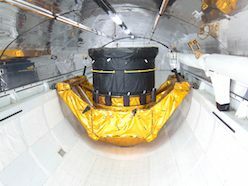 A MLI blanket is used for many applications on the spacecraft, such as structural members, instrumentation, antennas, radiators, wiring harnesses and sunshield covers. Dunmore multilayer insulation films have been part of nearly all space programs worldwide since the mid 80's and is widely used in US and European launch vehicles, both government and privately operated. Today's spacecraft and satellites see a multitude of temperature fluctuations that can range from lows of -100°C to highs of +150°C (-150°F to +300°F), depending the spacecraft's orbit. This can be Low Earth Orbit (LEO), Geosynchronous Earth Orbit (GEO) or Interplanetary Orbit. Orbiting in the shade of earth or the spacecraft's own shadow can pose a challenge in keeping the vessel stable in the rigors of space. The craft can swing quickly to the cold side (typically -125°C / -195°F) when in the shadows. Alternatively, the spacecraft can see extremely high temperatures, typically +150°C (+300°F), when exposed to the sun. Furthermore, there is a substantial amount of heat generated from the spacecraft's onboard equipment. Therefore, the spacecraft material must be highly adaptive to protect from both extreme heat and cold. Multilayer insulation blankets (also known as MLI insulation) are ideal to protect the delicate instrumentation in these extreme conditions. Multi layer insulation materials consist of lightweight reflective films assembled in many thin layers. These layers are typically made of polyimide and/or polyester films (according to design, could be from 5 to 30 layers) that are vapor deposited with 99.99% aluminum, on one or both sides. MLI insulation blankets often include a spacer material and metallized film that has been perforated. The multilayer films assist in the material's heat management by reducing incident energy with each successive layer. As it is very difficult to design an MLI insulation blanket that reflects 100% of incident radiation, a multilayer film design can range from a few simple layers to a complex array of blankets that completely surround the spacecraft and many of its external components. The designs of these layers typically reflect 95% of radiation back away from the Spacecraft. The total effect by the time the radiation energy makes its way to the innermost layers is a 100% reflective barrier. Ideally, temperatures which are most desired for a spacecraft to operate at maximum capacity is between -23°C to +40°C (-70°F to +107°F). This is accomplished by using MLI insulation materials that will work for both active as well as passive systems. Active systems can be best described as energy sources such as battery powered heaters, which work to keep the spacecraft at nominal temperatures (+70°F) during cold cycles. Passive systems are best described as using engineered materials, as are found in MLI blankets and offer radiation heat barriers to retard and control the flow of energy. The terms absorption and emittance are two critical factors in the design and effectiveness of a multilayer insulation system. Absorptance is a material's ability to reflect solar energy. Typically, a material that has low solar absorptance will have high reflective properties, such as a mirror that deflects heat (solar energy) away from the spacecraft. Depending on the requirements, various levels of solar absorptance can be achieved. Dunmore's multilayer insulation films are specifically designed for these applications. Vacuum Deposited Aluminum (VDA) is the most commonly used coating as it offers low absorptance and emittance properties at an affordable cost. Emittance is a material's ability to radiate energy in the form of heat. Similar to a hot coal, once the energy source (in this instance - fire) is removed, the coal continues to emit heat. MLI insulation materials with high emittance will radiate heat long after the Spacecraft is out of the sun's exposure. By design, both Absorptance and Emittance properties can be configured to control the temperature of the spacecraft surfaces. In order to ensure complete compliance with the requirements of the United States Departments of Commerce and State, Dunmore does not include a detailed product catalog or data sheets on our website. If you need technical information, please contact us. We will get back to you immediately. We appreciate your understanding regarding our strict compliance to the regulations. Please Contact Us to find out more about using multilayer insulation films and tapes for the manufacture of your MLI insulation systems. DuPont™ and Kapton® are registered trademarks of Dupont or its affiliates.